Matrixxx999 on Smacking A Dragon-God Off His Own Citadel! 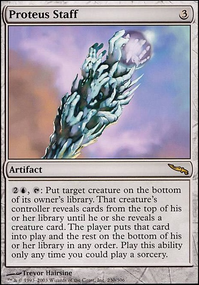 I also consider the use Bolas's Citadel in my Oloro deck too, it's insane card. I even thinking to cut Ad Nauseam for it. Delay - 2 cmc counterspell is always good. And in esper is even better. Dawn of Hope - stable card advantage engine with Oloro. And will work really good with Citadel. Lim-Dul's Vault and Brainstorm are great for top deck manipulation, Lim-Dul's Vault seems like a winning card with Citadel and Approach of the Second Sun. For replacing the infinite mana combos I have a few suggestions. 1: Mirror-Mad Phantasm and Laboratory Maniac . This one you need to be holding counters for, so it's de facto more complicated then I prefer. Basically you use the stack with this one so sequence is everything. 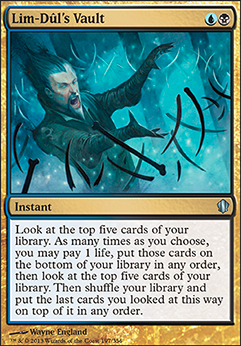 1: Play Lab Man 2:Activate a draw a card caged ability or play a card draw spell 3: In response, activate Mairsil's caged MMP ability and shuffle Mairsil into your deck 4: Put your entire deck into your graveyard since a card named "Mirror-Mad Phantasm" is not in your deck (the wording on the ability reverts back to "mirror-Mad Phantasm" as soon as Mairsil leaves play, even though the ability is on the Stack. 5: The card draw resolves and you win because you have no card to draw and Lab Man is on board. The additional advantage of running the Phantasm is that he acts as a risky AF version of Traumatize ing yourself if you cast him and activate. You may reveal him ten cards from the top, but also maybe 80 cards from the top. 2: Sage of Hours and Anthroplasm infinite turn lock. Technically not game ending and slightly mana intensive but once you have demonstrated that unless the opponents can remove Mairsil you have established a lock all but the most stubborn opponents will scoop. 3: Necrotic Ooze + Phyrexian Devourer + Triskelion / Walking Ballista The Diversion. Technically not a Mairsil combo but synergizes with many cards you will be running anyway, specifically Buried Alive . I have found this combo makes the deck far more deadly because it 1: Doesn't rely on the Commander and 2: Is incredibly hard to interfere with. If you need an explanation of how it works, ask and I'll elaborate but it's a pretty well known combo that appears in a lot of decks. 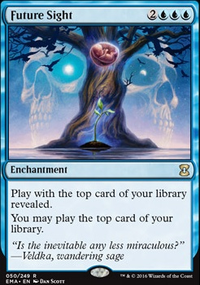 I definitely recommend running Chainer, Dementia Master and possibly some GY recursion like Reanimate and Animate Dead though if you're going to run this. On the subject of the wheels and Niv-Mizzet/ Locust God/ you forgot Nekusar. You could just do that as a different deck TBH.If I was going to play one, and you should be hard up for slots by this point really so I would only pick one, I'd go with Locust God as he provides chump blockers and if removed can be caged. Also, most smart players will remove Nekusar on sight. As for counters: Perfect. Turn Aside and Negate are exactly the type of cards I'm talking about. You're right. Most of the cuts have to do with the fact they're infinite mana enablers but not much use besides that. As for the two you specifically mentioned, Deadeye is just a personal bias. I think his CMC is too high in a deck where mana, especially blue mana, is such a precious resource. He's amazing when you can get him online (though not perfect, he doesn't do anything against board wipes) my concern is getting him on board able to protect himself AND Mairsil from one removal spell is 8 mana. Think of it this way, if Deadeye Nav said "to cast this card tap all your lands and skip this turn you may not cast instants or play abilities until your next turn" would you play him? I imagine the answer is no, but that is pretty much his casting cost in a deck where keeping a few lands open as much as possible is so important. Anyway, that's all I have for now. Once again, check out the MTG Muddstah video's featuring Harry's Mairsil deck, you'll find it very enlightening. Hope you start enjoying the deck more and let me know how it works out if you stick with it. hudsonw on Go Ninja, Go Ninja GO! 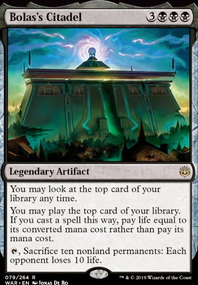 I would definitely swap out your Diabolic Tutor for at least Mystical tutor, and budget depending, the other 2 I listed as well. Maybe Crystal Ball but I find it too slow. You could also focus the deck more by taking out the graveyard recur. I would also add more 1 cmc unblockables to enable all your ninjustu ninjas. Here's my decklist: http://tappedout.net/mtg-decks/hits-you-with-ninjutsu-yuriko-edh/ It's very focused on what Yuriko wants to do. I think this could be a very functional deck. The important thing is to choose some synergy shared between the cards you really want to play, so the deck can function without having to rely on the raw power of commander staples you're foregoing for themed cards. I think that, being base Grixis with a focus on artifact tokens, artifacts should be leveraged, for sure. The graveyard is another place you could pick up some value, as mentioned above. Just try to have a plan beyond "play treasure stuff until I can find a combo to win." That might even mean cutting some of the really mediocre theme cards like Gleaming Barrier . You can also build to your commander a little bit. Not every card needs to be on theme, so while Villainous Wealth hits all the right spots as both an enabler and payoff for Ramos, some good nuts-and-bolts cards that are easy on the manabase like Crosis's Charm , Bedevil , Terminate , Rakdos Charm , Dreadbore , Lim-Dul's Vault , Notion Rain , Memory Plunder (on theme! ), Countersquall , Counterflux , etc. could be good. Also, while you don't need to go all-out on the manabase, since you're just splashing white and green, try to shore it up with some easy replacements. Finishing out the Vivid lands and picking up a the tri-lands that hit your main colors could really help the deck run more smoothly. Everglades is pretty bad, meanwhile. Hi there! My Yuriko, the Tiger's Shadow is part ninja tribal, part topdeck matters, and it is aggresive enough to win turn 5-6 (no infinite combos). Goal of the deck is to show fat cmc cards from the top with Yuriko or other ninjas (or creature type shenanigans) and kill the table with Yuriko's ability. Note that most of those can and should be played instant speed with yuriko triggers already on the stack. 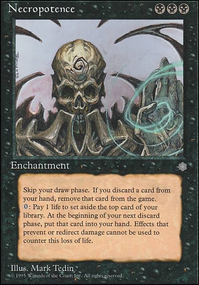 You tutor for: Commit / Memory Temporal Trespass Blinkmoth Infusion Draco Treasure Cruise Draco and Blinkmoth Infusion should go last, unless you go for the win, as they are unplayable. 30 damage to each opp with just 2 triggers is really fun. I want to increase ninja number >> higher damage output and swapping Okiba-Gang Shinobi with Ninja of the Deep Hours - draw is better, than discard. 1.4 Added more interaction, maximized my top CMC spells, added some expensive proxy cards. hkhssweiss I run Shadow of Doubt as a fun little pet card in Tasigur control. 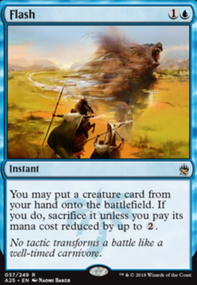 In practice, it has proven to be one of my favorite "counterspells", often punishing greedy players who start with a two land opener, and one of them being a fetch land. When they decide to crack it, they won't find a land and stay mana screwed on one. It also shuts down just about every tutor aside from things like Lim-Dul's Vault and Demonic Consultation .